Just one inning later, Mike Trout pulled off an even bigger play, making a leaping catch at the wall in center, taking a home run away from Yelich. 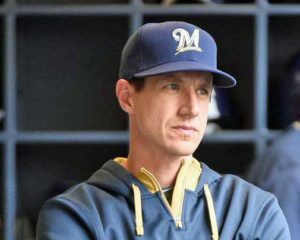 Brewers manager Craig Counsell said the play of the game may have come in the second when Andrelton Simmons gloved a ground ball that looked like a hit, spun and tossed to first to get Lorenzo Cain. Mike Moustakas had two hits, including his 150th career home run to tie the game 2-2. But Simmons put the Angels right back in front with his blast to left. Bour gave the Angels some cushion with his two-run home run off of Brewers reliever Chase Anderson in the eighth. Game two of the series is Tuesday night. Freddy Peralta (1-0, 3.27) goes for the Brewers. Matt Harvey (0-1, 9.00) goes for the Angels.